The huge mound rose out of the hole in the Earth, a mountain not of rock or soil, but of rubbish. A huge compactor with spikes in the wheels and a massive bucket on the front beeped and revved as it moved piles of waste around the plateau at the top of the tip. Above hundreds upon hundreds of gulls circled, a swirling mass of grey and white, calling and screaming, peppered with the black shadows of crows and small flocks of starlings. Dwarfed by the compactor and the other trucks on the tip, a white Landrover and trailer bounced and slid its way to a corner of the tip face and near to the sloping edge of the mound. On opening the door a sweet, sickly smell of rotten food and rubbish assaults the senses, but surprisingly you soon become immune only occasionally getting a strong whiff as the morning progresses. Amongst the piles of rubbish, seven intrepid ringers set a net. Not a fine mist net strung up between two poles, but a net lying on the ground and attached to rods which protrude from canons. Yes canons. On firing the canons fire the rods out taking the net with them, up and over the birds beneath. With the net ready, we retreat and the compactor pushes over a load of fresh rubbish, laying it in front of the net. All there is left to do is wait, wait for the gulls to settle and feed, wait for the right time to fire the net, wait for the right kind of rubbish to come, and all the while trying not to think about what exactly it is your standing on. A continual stream of trucks brings fresh rubbish to the tip face, dumping their contents before the tractor and compactor spread it around. The minutes tick by, it gets colder, our feet and fingers go numb. With a fresh load spread out in front of us, finally there is interest. A moment later and a muted boom echoes out, the net had been fired. 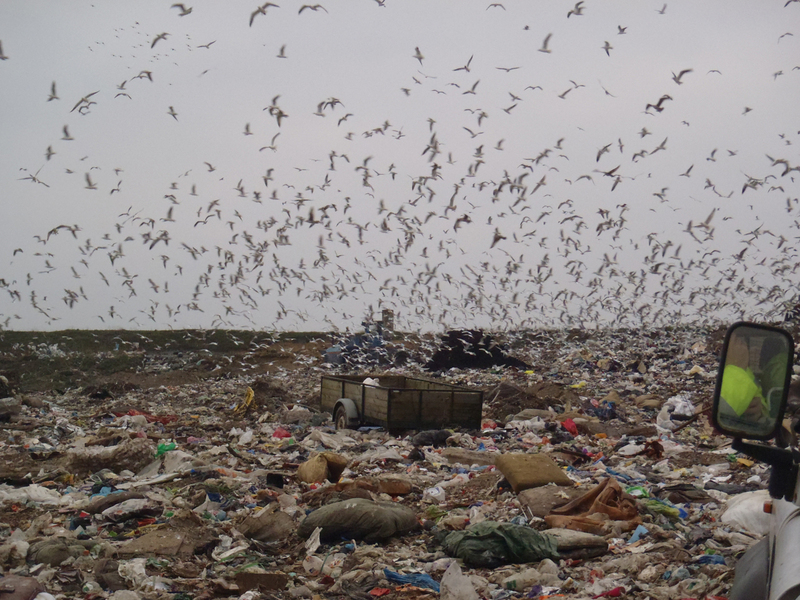 In an instance we go from waiting to action, scrambling up and over the piles of rubbish, towards the net beneath which are a hundred or so gulls. With the gulls removed from under the net and placed into Hessian sacks, we could settle down (as settled as one can be on a rubbish tip) to process the catch. 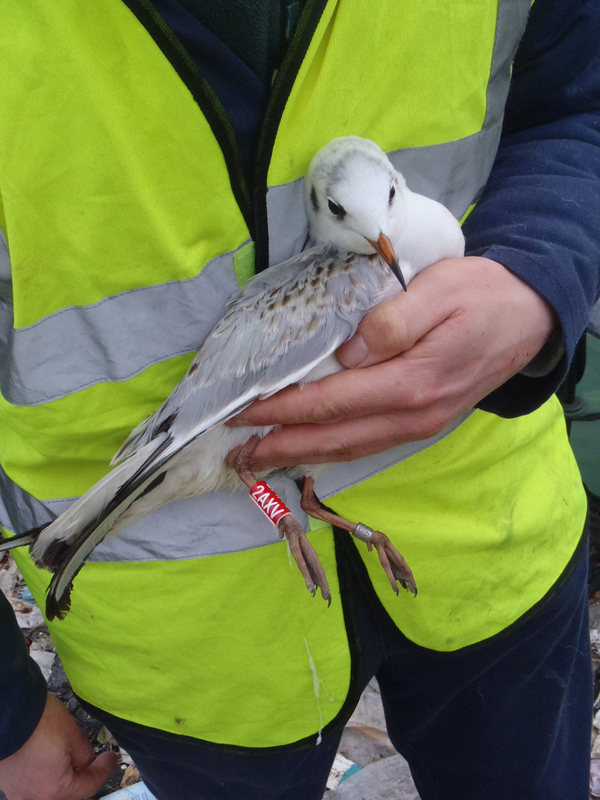 Next there were 99 black-headed gulls, each one ringed with a uniquely numbered metal ring and a bright red and white colour ring. Small and dainty, black-headed gulls are easy to handle, and since they attain adult plumage after one breeding season they are relatively easy to age. Then there were 70 lesser black-backed gulls. Bigger, meaner, with a bill that’ll draw blood if your not careful, and even if you are! Aging in larger gulls gets more tricky as they will go through four juvenile plumages before they reach the full adult plumage that we all recognise. Most, if not all the birds today were adults, with only one or two retaining the odd juvenile type feather. Again each one was ringed with a metal and a colour ring. 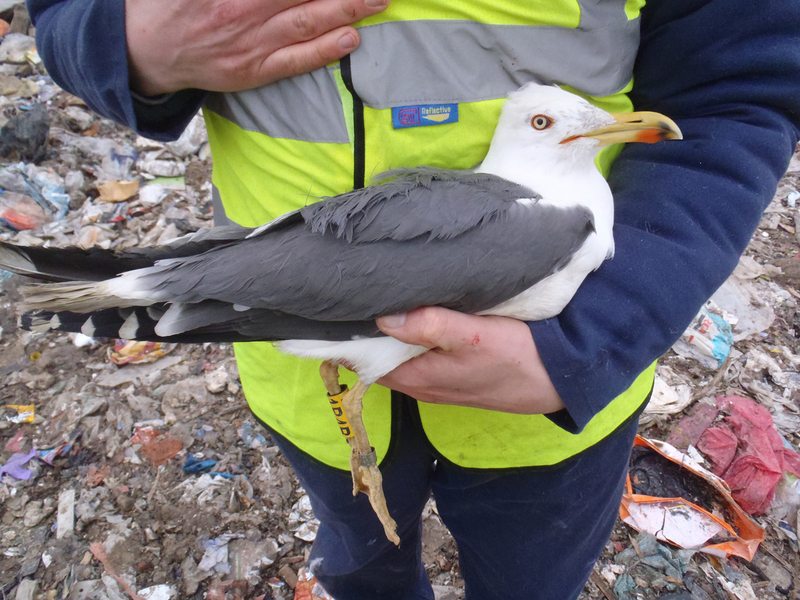 Recapturing gulls is unusual, so in order to increase the sightings rate of these birds colour rings are added which can be read in the field without having to catch the bird again. After the lesser black-backed gulls we moved onto 19 herring gulls, this time with more juvenile birds and a range of ages, providing an excellent opportunity to see how the plumage varies. The last bird of the day was a beast, they are not called great black-backed gull for no good reason. Not only are they larger overall and their back blacker, their bill is monstrous. With this bird you can’t even give it a chance to bite, do so and it may well snap a finger. Still never one to dodge a challenge, here I was with this adult bird lain across my lap, head safely tucked away beneath my arm, wrestling to put one of larger and harder rings in the BTO ringing scheme on its leg. So why, why stand in the cold on a smelly tip in the middle of February? Why run the risk of injury handling such big, mean birds? 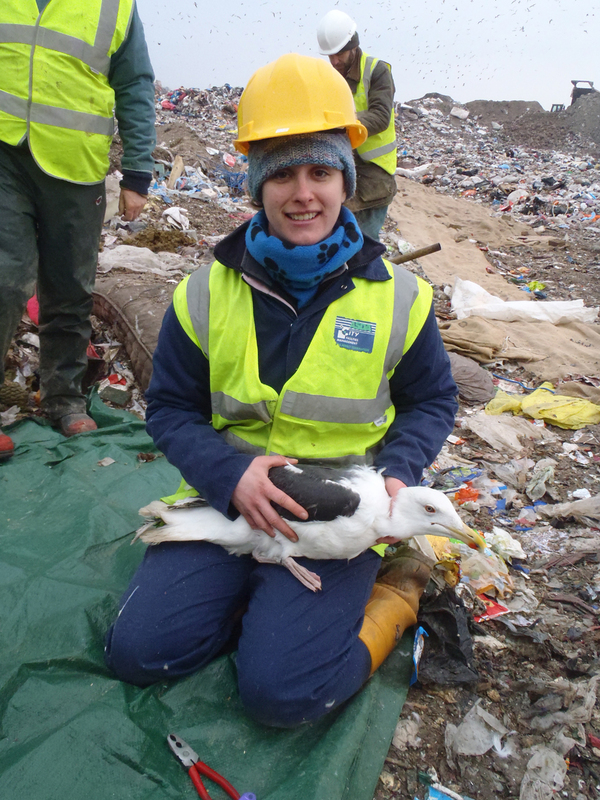 Landfill site may be stinky horrid places for us, where we hide our wastefulness underground, but for gulls they are the perfect place to feed and loaf during the winter. And they do so in vast numbers, providing the perfect opportunity to catch them in large numbers. By catching and colour ringing these birds we can find out where they move during the winter, where they breed and how this may vary between different species, ages and populations. 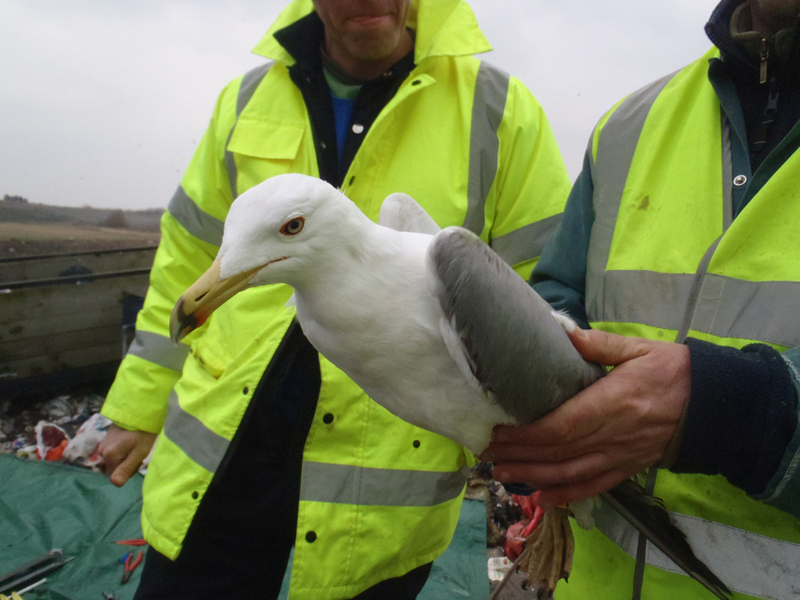 It may surprise you but many of our large gull species are declining, and ringing is just one tool to help establish why. One bird in particular during today’s catch highlighted this perfectly, a black-headed gull with a Lithuanian ring on. Hatched last year and in all likelihood ringed as chick in the breeding colony. Now here it was feeding on an English rubbish tip. As they say… It’s a dirty job but someone’s got to do it….